There has been many a starry eyed person, young and old, with a longing to step back in time and see the world of the early explorers and indigenous people. Horses have been an important mode of transportation historically and in the present times. They provide us with a means to go to further and more remote areas, exploring unknown and seldom seen territory. 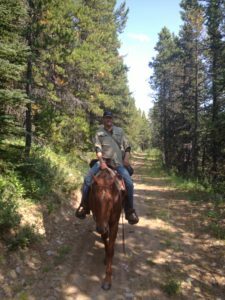 We are fortunate to live in a country where we can still access trails systems that have been opened up by Horseman long ago. The traditional method of packing a horse is a dying art, modern polyester bags thrown over a saddle are replacing the old sawbuck saddle and wooden boxes. Like so many things in our modern world, we discovery the old way of doing things and taking the time to keep these traditions alive had its merit. Many hours were spent in shaping and carving out each sawbuck saddle to fit a specific horse, with this kind of care taken, the horse would not get sore and injured. The old wooden boxes were virtually indestructible and people who take shortcuts in backcountry packing soon find that the polyester set up just doesn’t hold out very well especially when traveling through dense areas of timber. The art of packing a horse is a tradition that is well worth keeping alive. 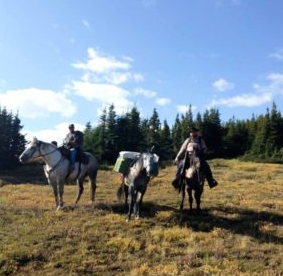 A pack horse and saddle horse allow us as travelers in the wilderness, to bring supplies and carry out game meat, they lead us back to the trails that are seldom traveled. 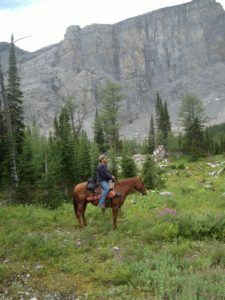 There is a certain peace and tranquility brought about when you are on the back of a good saddle horse. The crispness of the mountain morning, with the bells of pack horses playing the song of the trail. This session will cover equipment and two different methods of packing a horse. 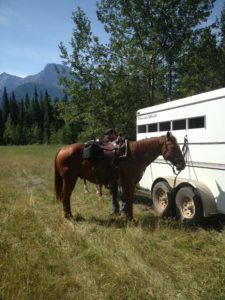 Proper fitting equipment is essential to make sure the horse or mule is comfortable and able to do their job. This section will go over how to make sure the gear fits how it should, what to look for and what to do if the animal becomes sore. Modern vs. traditional. We explore the pros and cons of each style of equipment; modern style where bags are used and traditional pack boxes. This section covers the hitch used to attach pack boxes to the packsaddle, we also include the knots used to get a load of quick. Double diamond is our hitch of choice; one person, even on a taller horse, can do this method easily. if we are unable to bring packhorses to the foothills camp, this session will be done using a barrel on a stand.